The paper reports on experiences accumulated during a EU research project where challenges pertaining to requirements-driven metamodelling agility have been analysed. Traditionally, modelling languages are perceived as stable artefacts – that is, if they address a sufficiently large community with fixed modelling requirements on a fixed layer of abstraction. 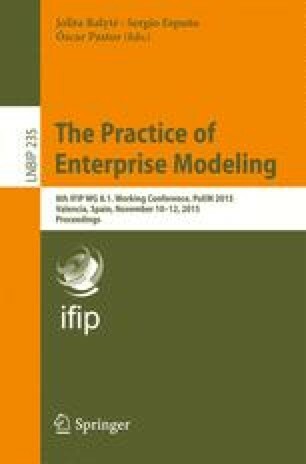 However, the enterprise modelling community must also consider the case where evolving requirements emerge in a narrow domain, or even in a single enterprise, therefore reusability across domains will be sacrificed to the benefit of on-demand adaptation, specialization or integration. Under such conditions, an agile metamodelling approach was applied in the ComVantage project and this, in turn, raised specific requirements for conceptual and technological enablers, allowing us to derive conclusions that are generalized here beyond the project scope. The paper’s concluding SWOT analysis highlights the need to stimulate the emergence of an agile metamodelling paradigm based on community-driven enablers. The research leading to these results was funded by the European Community’s Seventh Framework Programme under grant agreement no. FP7-284928 ComVantage.